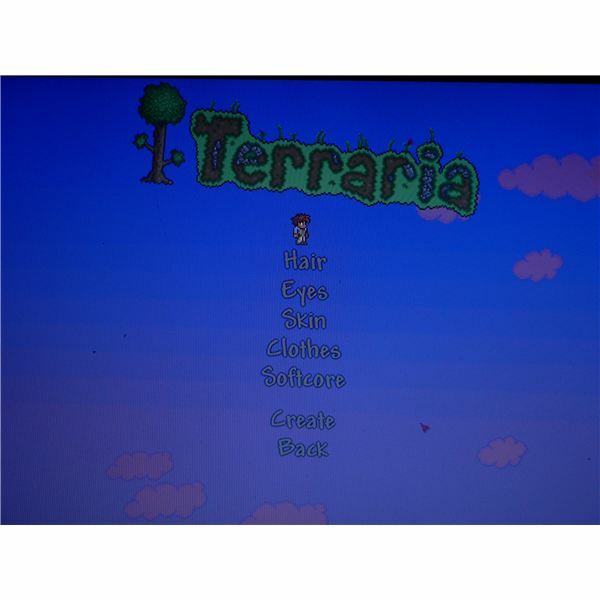 What is Terraria? And is it Similar to Minecraft? 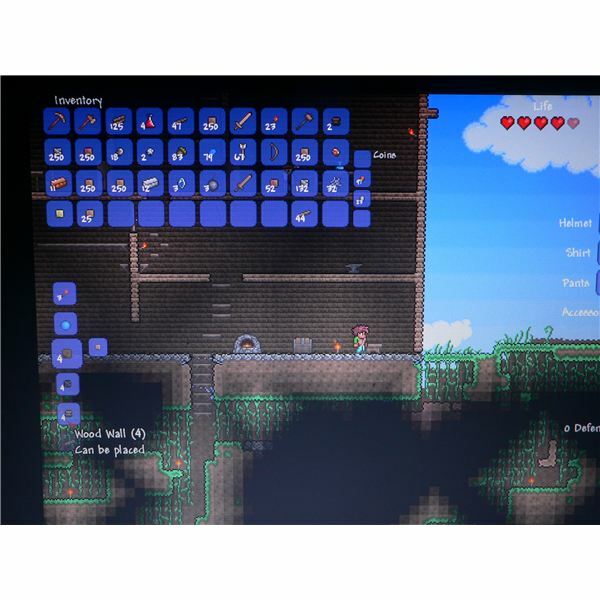 Terraria is a rather unique game, made by an indie developer. While I cannot verify the similarity due to not having played Minecraft, I can say that people have compared Terraria to it. On a quick glance, there are certainly similarities since you can shape the world, but I'd wager Minecraft is more in-depth. Of course, this is an opinion formed on a few quick reads about that game. The title also looks like a SNES game, but don't let that put you off from trying the game, because the gameplay is good as long as you know what you're getting. What you can expect is a game that has a mixture of sandbox and rpg elements. This'll be explained in the next section. One thing that does need to be pointed out though before moving on is the fact there's absolutely no story in the game. The story is essentially what you make of it, if that is anything at all, as there is no dialog or cutscenes at all. It doesn't matter though. When you go to start the game, you'll be faced with two tasks. One is to create a character and the other is a world. Creating a character is simple and you customise the character's looks only. World creation is also simple, with you needing to select the world's size. However, this may change in the future as you may also have a choice of different world types to create (more on this later). Even the smallest worlds are quite large also. They're also randomly generated. In addition, a character isn't tied to a specific world. When you get into the game itself, you'll be placed in an unknown world with nothing but an axe and a pickaxe. You're forced to learn the game quickly if you want to survive the wandering slimes and this is just during the daytime. When night falls, things get worse as floating eyeballs and zombies attack. So, before nightfall, you'll have to cut trees down for wood and build yourself a shelter. You do the actual building by gathering and placing 'blocks', then applying a wall in the background for a home. This leads me onto the next point. The game might be played from a 2D side-scrolling perspective, but the game world has a tremendous amount of depth in the sense that you can dig underground for what seems like forever and you can also 'build' upwards for what feels like forever. You have to dig underground to acquire various materials for constructing a building that can house NPCs and give you a safe spot to return to. The further down you go, the tougher the enemies are. There's also quite an in-depth crafting system implemented that allows you to craft armor and weapons, amongst other things. This is also where the RPG elements come into play. Your character may not level up, but he/she becomes stronger by equipping items and there are rare items you can find that increase your health or mana. In addition, there are also bosses to defeat once summoned and there is a dungeon to work your way through for good items. Now then, there's also the promise of continued support for the game and so far, the developers have kept the promise with providing new content often. They have stated that they even plan to add new world types to provide players a way of progressing further once they're finished with the default world. Overall, the gameplay is addictive and if there are any faults to be found here, it could be that enemies respawn a bit too fast. The game also features multiplayer. Before covering it though, it does need to be said that it may not be too easy for users to connect to servers in order to play with other people. Now that that's been mentioned, multiplayer is perhaps the best way to play the game if you play with people you know due to the fact that there's no possible chance of you being griefed and having the structures you've spent time building destroyed. However, with that said, the game is still fun when played alone and maintains that addictive quality. The reason it's perhaps the best way to play as well is because more than two people can play at a time and if you play alone, there's nobody to laugh with at your own mistakes. Plus it's geuninely good fun working with others and shaping the world, alongside building a home and finding items. Also, there's one other advantage. At the game's start, you need to be quick in getting some shelter built. So, one of you could build the shelter while someone else defends you from monsters and/or gathers wood. Of course, when you get used to this game, this isn't much of an advantage at all. The game literally oozes replayability. It's impressive how replayable the game is for the price that the developers are asking for. It has a lot more replayability than the first person shooters released these days at full price (assuming you don't enjoy the multiplayer). What's great about the game's replayability is that no game will be the same, because all of the world's map is randomly generated at creation. As mentioned above as well, the large worlds are really quite big. Even the small worlds are of a decent size. Aside from the game's map being different every time you create a world, there's also the promise of continued updates that should keep you coming back for more. The user interface is fine really. Your health is displayed at the top right of the screen and also at the top of the screen is a quick bar with items displayed in the boxes there that allow you to equip them quickly. If you press escape, your inventory screen will be brought up. From here, you can drag items into your quick bar and also check how many of each item you have. The item on the quick bar can be accesed by pressing the relevant key as well or by left clicking their box. If there is one complaint, it's that it's not clear what items are needed for recipes. What is nice though is that the crafting interface only shows recipes that you have at least one of the ingredients for. Control wise, for getting around the world map and combatting enemies, everything works fine with you pressing the left mouse button to attack and using the mouse to aim. In addition, the space key allows you to jump. The game's graphics are cute. There's no other word to describe it, except you could also say the graphics are vibrant when on the world's surface. Again, don't let the fact that the game has SNES like graphics put you off. You also have to remember that the game is by a small indie developer. On the presentation and sound front, the only complaint I can issue here really is that they could have included more music. The music included is good, but it may get repetitive after a while. Also, they've implemented a physics system well when it comes to simulating how water works. If you tunnel underneath water, it'll fall to the floor below and begin to pool there. Sand etc. is also simulated. So, the developers deserve a pat on the back in this regard. The game's sound is quite fine. When you attack an enemy, you will hear your weapon cut the air and firing arrows bring their own side-effects. The sound is also different when striking the enemies. Of course, it's something to be expected from games these days, but it's worth mentioning because the game is an indie title. Basically, the sound's good and perfectly functional, especially for the price the game can be bought for. On the music front, the music included is good and catchy. However, there is a distinct lack of tracks, so the music can get quite repetitive after a while. The game is definitely worth the money the developer's are asking for. The game's currently available on Steam and if you do purchase it, the developers have been releasing updates often, with an interval of between one to two weeks each. If they continue the updates at the pace they've currently been releasing them, the game should continue to get better, bigger and evolve very quickly. There's already quite a lot to do in the game without continued updates. To illustrate how much content they can build within a short time period, I believe they made the game within four or five months.